As I was meditating last night before bed, I asked my inner guide to lead me to a miracle. I had been in a funk for the last few hours and felt a huge sense of fear about where my life was taking me. I felt uninspired and I had been feeling and thinking negative thoughts about my full-time job, my current financial situation and my lack of confidence in where I deserved to be. I was praying for a shift in perception and calling on my higher power/inner guide to guide me. My meditation was clocked for 10 full minutes and in the last 30 seconds of the meditation my answer came to me. Within the silence of my mind, I could hear my guides whispering ‘Labryinth.. Go walk the labyrinth.’ Ding! The timer went off and inspiration flowed through me. As I laid my head down to sleep, I reminded myself that tommorow I would go to the labyrinth nearby and walk the sacred journey. I felt at peace. I awoke this morning and meditated, drank my green smoothie, did my morning pages, sang and of course caught up on facebook. As I browsed through my facebook I came across a photo of a labyrinth and thought! “OH YEAH!” So I dropped what I was doing, got dressed and headed to the labyrinth. This was the shift I needed to make in order to be exactly where I am RIGHT NOW! As I walked the labyrinth, a sense of peace flowed through me. I could feel the sun beam down on my face and the whispers of my soul guiding me and reminding me how good things really are. I felt my feet on the ground and the energy in my body moving smoothly. My energy began to shift and as I entered the center of the labyrinth, I paused. I closed my eyes, I stood in mountain pose and listened. I could feel the sense of centeredness that I needed in order to lift my arms in sun salutation and thank the universe/God and all of creation for the very moment that I had been given. It was a miracle in itself. It was a reminder that LIFE IS A SACRED JOURNEY! A few hours after my labryinth walk, I checked my email and in my inbox were two emails in regards to about 5 kids yoga classes that I was being offered to teach in the fall. My inner passion was ignited and excitement flowed through me. I was experiencing the manifestation of the shift that had occured from last nights meditation, which lead to this mornings labryinth walk, which lead to the answer that I had been truly longing for. God is good! Thank you Big Guy in the sky for always listening and answering my prayers! Are you wondering what a labyrinth is? 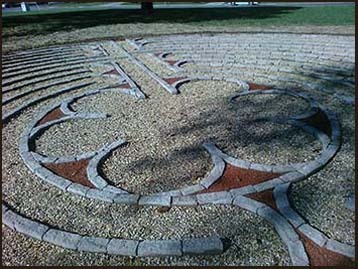 The labyrinth is an ancient tool containing a meandering but purposeful path leading to a center and out again. 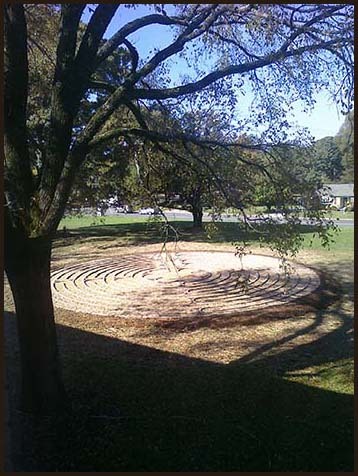 People walk a labyrinth as a way to meditate, to pray, to connect with God, to deal with their life and all its details, to be healed, to be released from paralyzing fear or despair. 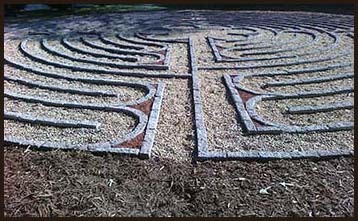 The labyrinth is a sacred path, symbolic of life’s journey, and is meant to give those using it a chance to find wholeness, piece of mind, direction, guidance. Unlike a maze, which has dead ends, tricks and turns, a labyrinth has no dead ends and no trickery is involved. There is an entrance, there is a center, and there is an exit. 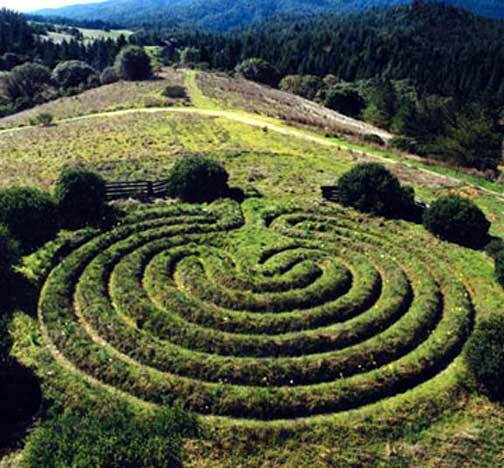 Labyrinths have been known to the human race for over four thousand years. The oldest surviving labyrinth is found in a rock carving in Luzzanas inSardinia, and dates from 2500-2000 B.C.E. The earliest Christian labyrinth is most likely one found in a fourth-century basilica in Algeria. Church labyrinths were particularly popular during the Middle Ages.